Dr. Todd S. Harris has been awarded numerous awards over the years. 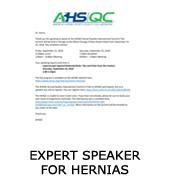 His commitment to his patients by ensuring outstanding care and a concierge type approach to hernia surgery, is demonstrated by his ongoing recognition with these top recognitions. The awards are some of the most important to any physician, including Dr. Harris, since many are voted and awarded by the patients themselves. Others are given to Dr. Harris for his overwhelmingly positive feedback from patients online. 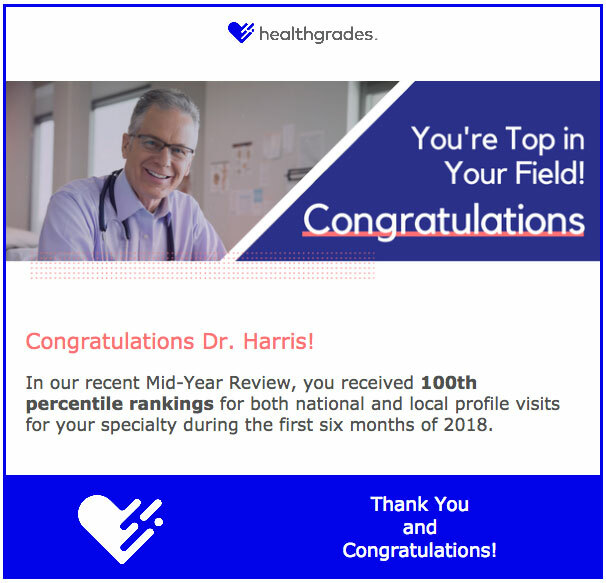 In the recent Mid-Year Review, Dr. Harris received 100th percentile rankings for both national and local profile visits for hernia surgery during the first six months of 2018. He is the highest rated surgeon in the country on Healthgrades as well as the most reviewed physician in the country in any specialty. 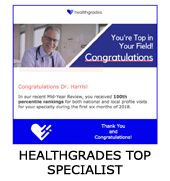 Healthgrades is the leading online resource for comprehensive information about physicians and one of the most trusted sources for patients seeking guidance in selecting a physician. (From Castle Connolly) Most people would agree that gambling with their health care is a dangerous idea. When it comes to medical care, excellence and expertise are crucially important. Yet Americans receive top-quality care from their doctors and hospitals only about half of the time. From inadequate screening during routine checkups to subpar treatment of critical illnesses, inferior care can have costly and tragic results. Too often, patients simply don’t know how to find the best doctors, trained to deliver the best care. Castle Connolly takes this challenge seriously. 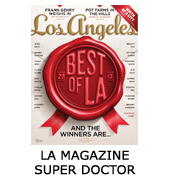 Since the company’s founding in 1991, our “Top Doctors” guides have been identifying the nation’s best doctors and hospitals in every part of the country and in every medical specialty. Our lists are based on peer nominations and professional assessments by our physician-led research team not on hype, advertising, or third parties that have something to gain by recommending a particular provider. Castle Connolly’s Top Doctors are rigorously selected from among hundreds of thousands of physicians. Our intensive research methodology is designed to identify doctors that will speed patients’ healing, minimize pain and discomfort, shorten recovery periods and enhance and lengthen lives – in other words, achieve the best possible health outcomes. The Patients’ Choice award is awarded to physicians based on patients’ appreciation and praise for the quality of care and service provided. Every month, more than 200,000 patients across the U.S. provide online feedback about their doctor experiences. They rate various components of the care they receive, such as bedside manner, doctor-patient face time, follow-up care, ease of appointment setting and courtesy of office staff. They also share their overall opinions. Over the course of 2013, hundreds of thousands of patient reviews were written and shared. 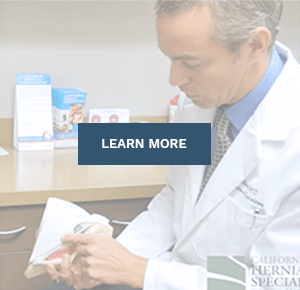 While physicians generally receive positive feedback from their patients, only physicians like Dr. Harris – with near perfect scores – have been voted by their patients for this honor. Dr. Harris is a physician who is not only highly regarded, but also highly recommended by his patients. Dr. Harris was selected as a Vitals Top 10 Doctor. Each year, over 120 million people visit Vitals.com to search for and rate doctors. Vitals analyzed patient-provided ratings and identified Top 10 Doctors within a certain specialty and neighborhood. Within California, Dr. Harris was awarded the Top 10 Specialty Doctor Award for 2014. 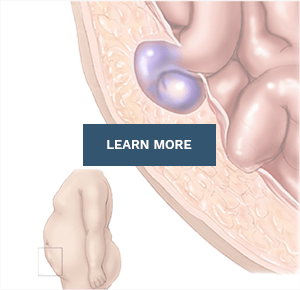 Dr. Harris is a specialist in General Surgery and Hernia Surgery, as well as Fellowship trained in Interventional Medicine. Only 1% of all doctors nationally meet the criteria for Top 10 Doctor honors. Dr. Harris’ patients have awarded him the elite distinction of being one of America’s most Compassionate Doctors for both 2012, and 2013. Out of 870,000 active physicians in the U.S., only 3% are accorded this honor. 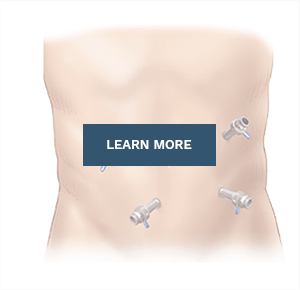 This award is based on the overwhelming positive reviews on HealthGrades and Vitals. He has been in practice as a surgeon for 10 years. 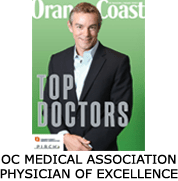 Dr. Harris and California Hernia Specialists was highlighted by the OCMA for their focus and dedication to hernia repair. 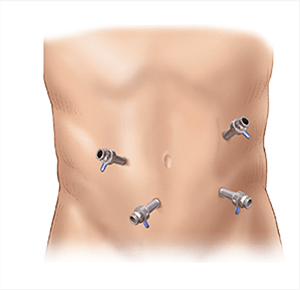 Many surgeons and many doctors offices across the region have the capability to see patients for their hernia. 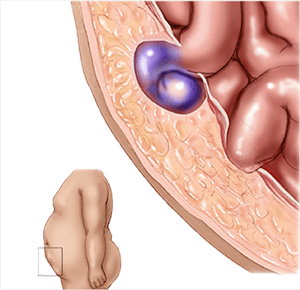 However, having a dedicated center to the treatment for hernias sets us apart from those other options patients may have.